Dancers perform for a large crowd at least year's I-Fest. Travel the globe this weekend, right on campus. It’s the 35th annual International Festival, or I-Fest, offering music, food, exhibits, educational demonstrations and live entertainment from nearly all regions of the globe. 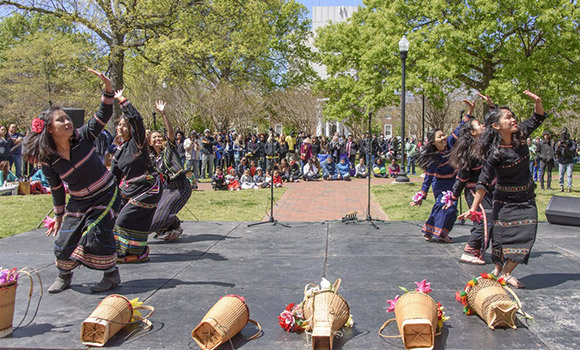 More than 29 countries and cultures will be represented this Saturday, April 8, at UNCG’s longest running cultural event on campus. This year, there will be 50 booths and 20 performances along College Avenue on campus from noon to 5 p.m., with cultures from Central and South America, Europe, Africa, Asia and the Middle East represented. The event, sponsored by IPC, is free and open to the public. A large Japanese Taiko drum ensemble, Earth Spirit Taiko, will kick off the festival performances at noon. Throughout the afternoon they’ll be followed by a variety of other performances, including Bollywood dance, Korean pop and Mexican dance from Jalisco. Many of those performing will be UNCG students. Food will be available for purchase from food trucks, and free food samples will be offered at individual booths. Crafts from different countries will also be for sale.